"How many people get to join a really good band, let alone AC/DC?" Mark Evans asks. "I could sit around and moan and groan about not being in the band anymore, but what good would that do? The bottom line is, I got to play with one of the greatest rock 'n' roll groups ever. That's not bad in my book." And when Mark Evans says "in my book," he's not being figurative. The former bassist for AC/DC has just written a compelling and highly entertaining account of his time in the iconic, ginormous-selling Australian quintet. Titled Dirty Deeds: My Life Inside/Outside Of AC/DC, it's an eye-opening look into one of rock's biggest, and most secretive, outfits. Although Evans' tenure in AC/DC was short-lived (he was a member from 1975-1977), it was during a pivotal point in the band's development. "We were really honing the classic AC/DC sound," says Evans. "The steady, pounding rhythms; the hard-edged, twin-guitar attack; the in-your-face vocals - it was all right there. It wasn't anything fancy, but it was honest. It was something everyone could relate to." MusicRadar sat down with Mark Evans recently to talk about his new book, his memories of playing with AC/DC, what the late Bon Scott was really like and how he came to grips with being tossed out of one rock's biggest acts just as they were on the threshold of greatness. Why did it take you till now to write this book? "Quite a few people approached me over the years to write a book. I don't know why, but it never really felt like it was the right time to do something like this. Then, about five years ago, after having so many people at gigs asking me what AC/DC was like, how was it hanging with Bon Scott and all of that, I finally decided, Hey, what am I waiting for? "I started writing, and before I knew it I had 40,000 words down. I showed what I'd written to a friend of mine, Peter FitzSimons, who's a very well-known author, and he was very encouraging. 'This is good. You can do this,' he said. "My main motivation, though, was to finally set the record straight and put the punters on the inside of the band. It's the first account of being in AC/DC from somebody who was actually there, so I'm pretty happy to get it all out." When you first met Angus Young and Bon Scott, did you think they had what it took to make it? "As I mentioned in the book, I didn't meet Bon initially; I first met Angus, Malcolm and Phil Rudd, the drummer. I had been given the band's first record to learn for my audition. I'll tell you, once the gear was set up and I heard those guitars live right next to me, it was like the biggest light bulb in the world went off over my head. I just knew this was going to work and that I was in the right place. What a sound! "I knew Bon a little bit before I got in AC/DC. He was something of a pop star in Australia. He was in one band, The Valentines, and they were kind of bubblegum, but his next group, Fraternity, was more like The Band - he really liked rootsy music like that." "Bon was a lot older than me, but we got along great. He was a star waiting to happen. As soon as I was in a room with everybody, I had a feeling it could go over big. In fact, I was sure it would. Bon was a real character, and when you put him up against those guitars, it was electric." Speaking of guitars, did Angus and Malcolm pay a lot of attention to perfecting what has become a classic sound? "I think they were very aware of how it was going to land with people. But like most great guitar duos, they were doing what came naturally. They didn't sit up at night thinking about their guitar parts or analyzing their sound - they were going on instinct. "You have to remember, they grew up in the same house, had the same influences and all that. They were very much on the same page. And what they've done is amazing. I don't think there's any guitar combination on earth that's any better." What made Angus choose an SG, and why did Malcolm pick a Gretsch? Did they ever tell you? "They didn't explain their choices per se, but I picked up on their reasons. Malcolm loved playing his 1961 Gretsch Jet Firebird. It was given to him by Harry Vanda, who was in The Easybeats with George Young - George is Malcolm and Angus' older brother. Since he was 13 or 14, Malcolm's played that Jet Firebird. He also messed around with a Gretsch White Falcon for a little while." "The Jet Firebird is pretty much gutted by now. It only has one pickup and one volume control. But it works for him. He plugs it straight into his amp, and there's his sound. "As for Angus, he went for the SG because it was small and light. Angus is a tiny guy, so he couldn't have a big heavy guitar on him - he'd never get through a show with something that was huge. Also, he loved Leslie West, who played an SG on some recordings." "They're not encyclopedias on guitars and amps, but they do know what works for them. When I was in the band, they both used early '70s Marshall JMP heads. They'd put those through a couple of quad boxes. "I think they came across the guitars and amps that they liked, and once they found what sounded good, that's what they stuck with. They don't go in for trying to have tons of tones; they do what they do, and that's it. Guitar, cable and amp - that's the two of them right there." Most great bands have great drummers. When you were in AC/DC, was it pretty much a given that you followed Phil Rudd? "Oh, absolutely. Phil's solid as a rock. As a bassist, I definitely followed his lead. But Malcolm, too. As far as I'm concerned, if you've got Phil and Malcolm together, you're flying first-class. We gelled very quickly, the three of us. To be in the rhythm section of AC/DC meant being a tight unit." What were the band's rehearsals like? Do you go over tunes assiduously? [laughs] "What rehearsals? There were no rehearsals! My very first gig with them was totally spontaneous. This was after the audition. I went to see them at a local pub, saw them play one set, and then I went on stage with them and played the second set. "For our first tour of England, they band rented a rehearsal space, but I think we mainly played some Elvis Presley songs. Real rehearsals - you know, running through the tunes and making sure everything was right - that stuff didn't happen." "Songs would be written in the studio. No demos. Angus and Malcolm would play things for George Young, and the tunes would be assembled right there. Once we had the skeleton of a song, we'd record it. "Angus was full-on in the studio. When it was time for him to record his solos, he'd jump around and bounce off the walls, just like he would on stage. It was impossible for him to play and sit still. For rhythm tracks, he was somewhat subdued, but for solos, he went wild." Think that was from all the tea? He's always been a big tea drinker. "Could be. He ran on tea, spaghetti bolognese, chocolate bars and cigarettes. There was always a big cloud of cigarette smoke around him." What about Bon? What was he like in the studio? "He had the luxury of hearing the tunes once they were mostly finished. He'd get the backing tracks, and then he'd go off to the kitchen of the studio and write down words. He used to spend a lot of time on tour working on lyrics, too. He was probably the most prepared of anybody when it came to writing songs." You wrote that Bon talked to you about a solo album he wanted to record. He was planning something very different from AC/DC. "Yeah, he wanted to do a record that was like a cross between Lynyrd Skynyrd, The Band and Little Feat. He loved that kind of music, very American, very Southern rock. The Allman Brothers, too - he was a big Allman Brothers Band fan. "He could sing that stuff real well. I heard him when he was in that band Fraternity, and he had it down. It's probably hard for people to picture that - they have the sound of Bon with AC/DC in their heads. But he had more to him, a lot of different sides. Very, very talented fellow. "That would have been a very interesting band meeting. [laughs] Bon doing a solo record - I don't know how that would have gone over. 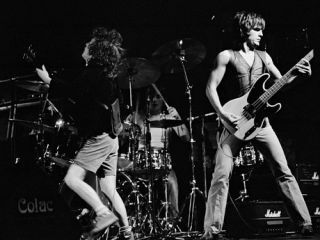 If you're in AC/DC, you're in it for the good of the band, not for personal side projects and things like that. AC/DC was never a very democratic bunch, but then, not many big bands are." In the book, you recount the distance you felt between you, Angus and Malcolm. Did you ever try to work on getting closer to them? "It was difficult. They didn't let people in very easily, and once they felt there was an issue, things could get even more difficult. With Angus and Malcolm, they were put on this earth to form AC/DC. They're committed big-time. And if they feel your commitment is anything less than theirs, well, that's a problem. "Angus was intense. He was AC/DC 100 percent. His work ethic was unbelievable. When I was with him, he expected everybody to be just like him, which is pretty impossible. Aside from Malcolm, there was no way anybody could be as committed to the band as he was. I was totally into AC/DC and never wanted out of the band for a second." It seems that you were never told concretely why you were kicked out. "Yeah, I did have some questions about it. At the time, Malcolm said something about them wanting a bass player who could sing, but I think that was a smokescreen. I don't know if there was any one reason. It's just the way it went down. I felt the distance growing between me and Angus and Malcolm. When I was fired, it wasn't so much a surprise as it was a shock. "There was a lot of tension in the band at the time. We'd just been kicked off a Black Sabbath tour, and this was right when a trip to the States was cancelled because the record company rejected the Dirty Deeds Done Dirt Cheap album. So it was a hard period. "Maybe it was the whole atmosphere that led to my being sacked. The group had a month off, so perhaps Angus and Malcolm thought, OK, time to make some changes. It was hard for me. I was very dedicated to the band. I loved the music we were playing, and I could feel that real success was right around the corner." Back In Black is the biggest-selling album by any band. Can you imagine that record with Bon Scott singing the songs? [laughs] "Wow! That would've been something, wouldn't it? Nothing against Brian Johnson, who's done a brilliant job, but yeah, it's sad that Bon never got to the Back In Black album with the guys. "You know, my two favorite AC/DC albums are Powerage and Highway To Hell - and I didn't play on them. People always find that funny. It's weird: When I think of AC/DC, it's always with Bon Scott singing. That's just the way I hear the band." What's your favorite song that you recorded with AC/DC? "Hmmm…that's tough. [thinks] I'd have to say Whole Lotta Rosie. Great song, right? We were firing on all guns. On the Let Their Be Rock album, AC/DC really started sounding like AC/DC. The die was cast. Hell Ain't A Bad Place To Be, Go Down, Dog Eat Dog - what fantastic, well-balanced record." It's surprising: You're still a fan of the band. You don't seem bitter about being kicked out of one of the biggest groups of all time. "Well, it's just the way I am. Being bitter wouldn't solve anything, would it? It's not in my personality to focus on the negative. Looking back and griping - it's wasted energy. You have to move on in life. You can't let the past drag you down. "I have a lot of respect for the guys in AC/DC. What they've done is incredible. And we had a lot of great times together, we really did. Me staying in the band…it just wasn't meant to be. That's the only way I can look at it."